With the popularity of Amazon and other online retailers, a lot of the thought and time that goes into picking out the perfect gift has gone away. Sure, on these sites, you can get respectable gifts at a reasonable price, but is it something the recipient will truly cherish? 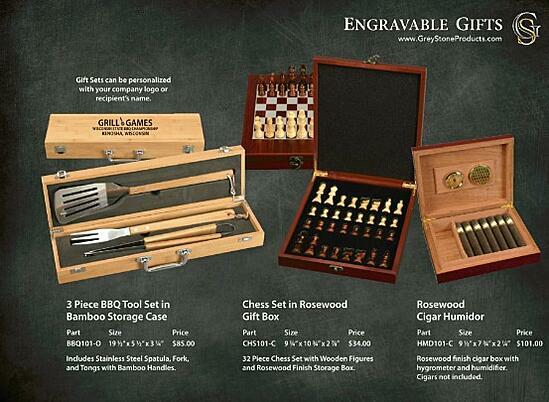 One of our most affordable gift sets is our chess set in rosewood gift box. The 32 chess pieces are made of wood and are easily stored within the box for portability. Each piece fits perfectly into its specific black felt-lined spot. The rosewood box also has a chess board incorporated into the lid. This is the ideal upscale gift for people of all ages. We recommend adding a personal message that inspires the recipient to continue challenging their mind. Sure, giving someone a fine wine of a great vintage is pretty classy, but if you really want to knock their argyle socks off, give them a couple bottles of excellent wine in a high gloss rosewood wine bottle box that is personalized with the recipient’s name or a company logo. We offer one-bottle and two-bottle wine bottle boxes. They each come with a stainless steel wine pourer, stainless steel hippocampal knife, one cork, and a silver paper/plastic cutting knife. What goes better with a fine wine than a high-quality cigar? 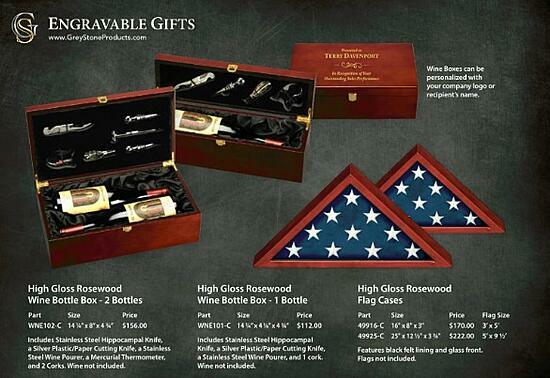 And, what better way to present cigars than with a rosewood cigar humidor. Our humidors come complete with a humidifier and hygrometer. They make a terrific addition to the desk or den of the cigar lover in your life. We have a standard humidor that is 9.5” by 7.75” by 2.25”, or we can custom make one for you. Is there a special grill jockey in your life? Or, do you have a barbecue cooking competition and are looking for the ideal trophy? Nothing beats the three-piece BBQ tool set with a custom engraved message. It includes a fork, stainless steel spatula, and tongs with bamboo handles. Old glory deserves to be stored properly. Whether you have a friend or family member with a special American flag, our high gloss rosewood flag cases with black felt lining and a glass front are ideal for holding any flag. This is just a sampling of what we have available. We have other solutions available for you, or you can bring an item to us, and we will engrave it for you. Adding initials or a name to a gift is a popular option, but we are also able to add images, logos, and more. 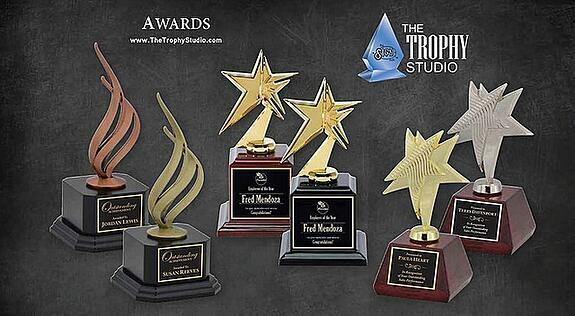 To learn more about what specific options are available, contact the friendly professionals at The Trophy Studio today for a free consultation and quote. Are you looking for a way to add a unique touch to your office? Are you in need of gifts for employees who go above and beyond? Or, are you simply interested in having a stylish way to display business cards? 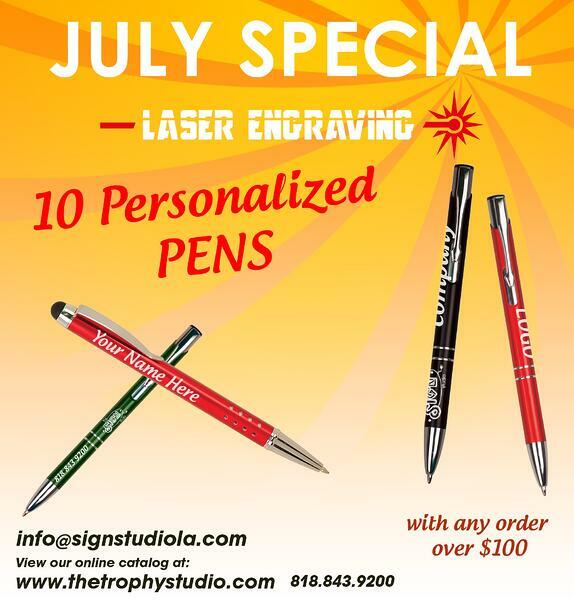 All of this is possible when you purchase laser engraved nameplates in Los Angeles. 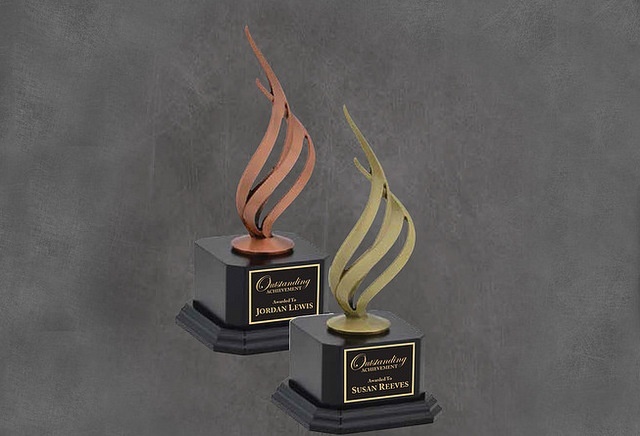 Read on to learn about some of the options available from The Sign Studio and our engraving division, The Trophy Studio. By placing a nameplate on each worker’s desk or chair, you can improve your brand awareness when clients visit. In addition, most employees determine their value within a company by their earned space and reputation. There is a sense of pride on the faces of workers who wear stylish custom badges. The name tag has an impact on employees while showing their designated role. This is especially the case with nameplates. You change the work culture and supply a degree of distinction when you offer personalized nameplates for each employee. Nameplates can be placed on cubicles, doors, or on conference rooms to keep non-personnel out of the area. If you are looking for an affordable solution that you can provide for your entire office, we recommend our high-gloss name blocks. They are available in 2” by 8” and 2” by 10” sizes. You can also choose from three colors: cherry, walnut, and black. If you have a little extra to spend, you should consider our high-gloss rosewood and metal name blocks. They are 3.25” by 12.5” and add a professional look to any desk. We laser engrave any name you want onto these name blocks. We can also list your employees’ positions on the nameplate. 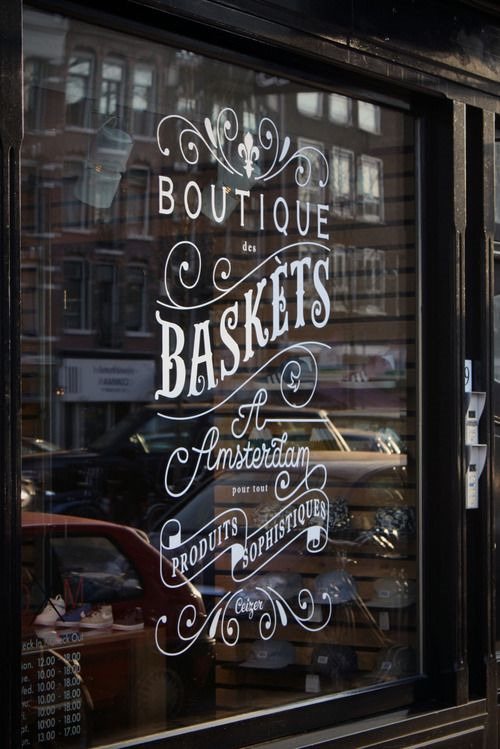 For an added boost in brand recognition, we suggest that you incorporate your business’s logo. If none of the options above sound good, we can create a custom design for you. You cannot let your business cards get tattered, torn, or rumpled. Otherwise, it will reflect poorly upon your enterprise. Laser engraved business card holders in Los Angeles keep your cards neat and tidy. Our top business card holder is designed from high gloss rosewood and metal for display on your desk. However, we can also provide laser engraved cases that you can carry with you to conferences, trade shows, meetings, and more. With our laser engraver, we can put whatever message, image, or logo you want on your card holder or nameplate. If you are interested in learning about the specific solutions we have for your project, contact the friendly professionals at The Sign Studio today for a free consultation. If you are a regular reader of our blog, then you have likely heard us talk about how trade show booths can benefit from retractable banner stands. It is easy to forget that there are also non-retractable banner stands. These banner stands are ideal for high-traffic areas and are typically more cost-effective than retractable banner stands. 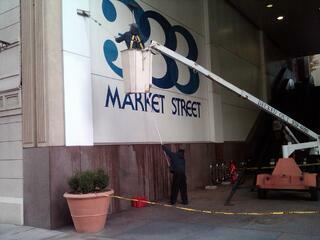 A type of non-retractable banner stand that is growing in popularity in the signage industry is X-banner stands. 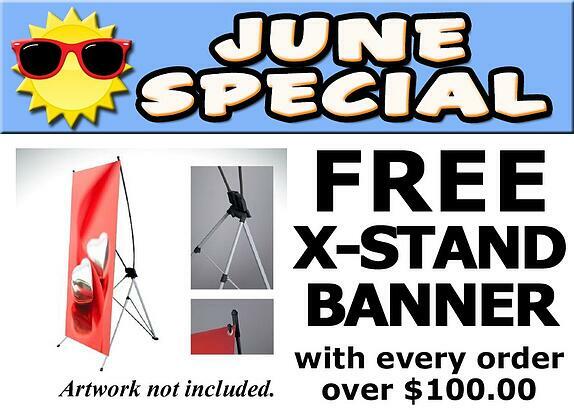 And, for the month of June, The Sign Studio is offering FREE X-stand banners with every order over $100 (just for June 2016). Let’s learn more about this signage option. How Do X-Banner Stands Work? Commonly known as X-frame stands, X-banner stands are made up of an X-shaped frame and a rectangular banner, which is usually printed on vinyl or fabric. The banner is stretched tightly and the four corners are attached to the four points of the X frame. It gets the support it needs to stay upright from a fifth pole that protrudes from the center of the X. X-banner stands can adapt to any terrain thanks to the extendable legs. X-frame stands are one of the most convenient and affordable methods for displaying your company’s banner due to their portability and design. To make certain your graphics look like new everywhere you go, we only use heavy-duty materials in the construction of these stands. Common materials we use are metal, PVC, and bamboo. Innovative, Trendy, and Allow You to Experiment – The great thing about X-banner stands is that they can display an array of banners. This allows you to cater to specific events without having to purchase all new displays. Easy to Set up and Move – It is extremely simple to set up an X-frame stand. Most have a central hub and five poles. You put the ends of the poles in the hub then attach your graphics to the frame. You can have your exhibit set up within minutes. Exhibits that can be set up by one person are necessary if you have limited staffing for your event. Inexpensive – Even if you are not getting them for free, compared to most other tradeshow displays, X-banner stands are incredibly affordable. This means you will have more money left over for vibrant, full-color graphics or other elements. Can Be Used Everywhere – X-banner stands are truly flexible when it comes to placement. You might consider putting your X-frame stand on sidewalks, on counters, in lobbies, in school hallways, or on tabletops. Lightweight and Portable – Whether you are traveling by car, bus, or train, it is easy to bring your X-banner stand with you. Transporting these marketing solutions is virtually effortless. They are a lifesaver if you are traveling by plane to an event. 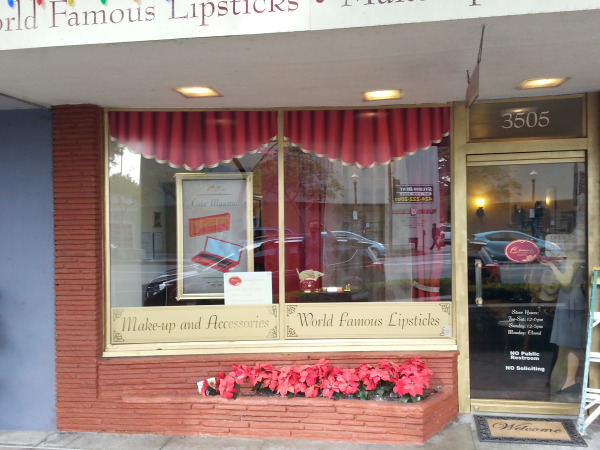 We offer X-banner stands in Los Angeles, Burbank, and Glendale. If you are interested in taking advantage of our June special, contact the friendly professionals at Blue Barrel Signs today for a free consultation. We cannot help but wonder if Milton’s life would have proceeded more smoothly if he had found The Sign Studio or our trophies and awards division, The Trophy Studio. We could have provided him with laser engraving services to ensure his name was on all of his office products, so no one would mistakenly take off with them. Fortunately, we are here for you with custom engraved desk sets in Los Angeles. Let’s look at what is available. Every office desk can benefit from our rosewood desk clock and card holder. This piece is made of high-gloss rosewood and features a distinguished analog clock along with business card and pen holders on the top of the product. There is also room for us to add an engraved plaque that can recognize an employee for their service or give that new self-employed loved one a supportive message. It is also currently the season for dads and grads. Give grads a fitting present that they can take along with them on the next stage of their journey. Or, show dad that you care about him every time he looks up from his work. Rosewood provides a professional, distinguished look to any desk. That is why we use it for many of our desk sets. We have two main types of desk plaques. The Metal Star & Rosewood Desk Plaque is a high-gloss rosewood plaque with a brushed metal base that features a polished metal star. We engrave the plaque with whatever message you want. We also offer the Regent Glass & Rosewood Desk Plaque. Once again, this features a high-gloss rosewood plaque, brushed metal base, and polished metal star. In addition, there is a glass plate on the front mounted with spacers. We engrave the glass with whatever information you want. 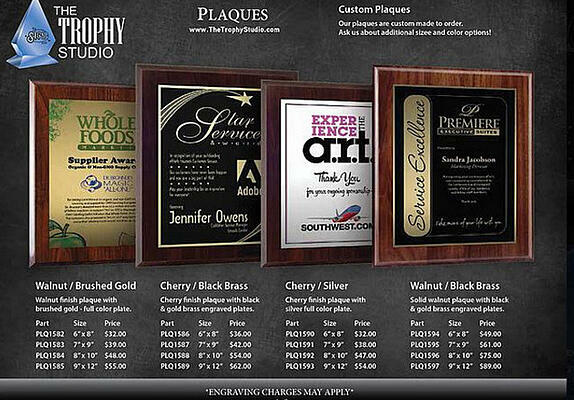 These plaques are ideal for awards for individuals or businesses. And, with our state of the art laser engraver, we can put whatever information you want on your plaques. For instance, we can engrave your company logo to show off your branding to anyone who sees the plaques. Give us a call even if you have something in mind that is not mentioned above. There is a good chance that we can make your dream a reality. We are talented at custom designing desk pieces using a broad range of materials. 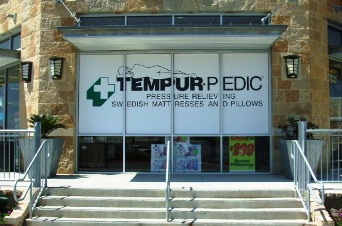 And, we can render any text or graphics you want on just about any material. Our graphic designers can provide you with proofs of what your finished item will look like before you commit to anything. 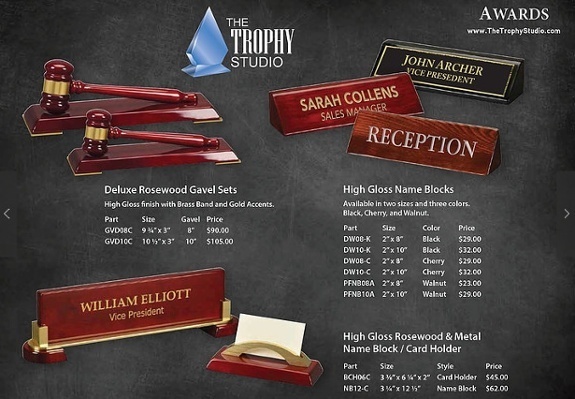 If you are interested in procuring custom engraved desk sets in Los Angeles, contact the friendly experts at The Sign Studio today for a free consultation. There is a wide array of events that call for giving all attendees a gift or keepsake. Since people have different tastes, many of these gifts end up gathering dust in a box somewhere. However, you can ensure your gift is put to good use with always useful laser engraved paperweights in Los Angeles. 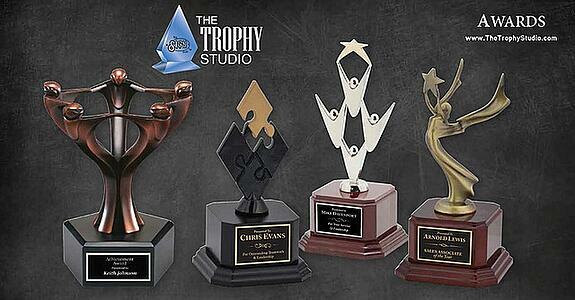 Fortunately, The Sign Studio and our award division, The Trophy Studio, are top providers of these items. Read on to learn about these useful gifts. What Are Some of the Best Uses for Paper Weights and Photo Frames? Corporate Gifts – Whether you want to give gifts to your employees to recognize years of service or you want to show appreciation to your business partners, corporate gifts featuring your laser-engraved logo serve a variety of purposes. For instance, a photo frame with your company name on it will increase your brand exposure wherever it is displayed. College Gifts – College gifts may be simple photo frames with a family picture and engraved with a loving message given to a teen about to head off to college. Or, it can be a paperweight with a college’s logo on it given away by colleges at recruiting events or as a thank you to donors and sponsors. Giveaways – Whether you are at a trade show or you want to offer something special to your loyal customers, giveaways are always best when they are functional. A paperweight will help keep people’s papers in order while keeping the name of your company close at hand. These are just a few of the reasons people call us for laser engraved photo frames in Los Angeles. They also make great wedding gifts, party favors, awards, and more. What Types of Photo Frames and Paper Weights Are Available? We have several standard photo frames and paperweights on hand. A favorite photo frame solution is the acrylic magnetic photo frame. It can be used vertically or horizontally and is held together with powerful magnets. 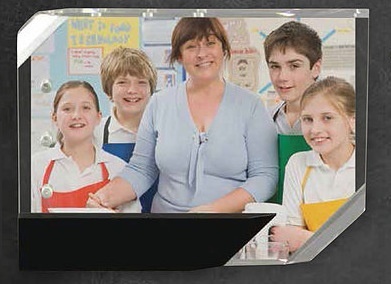 Our paperweights are available in acrylic or crystal. Acrylic is preferable if you are looking for an affordable solution. 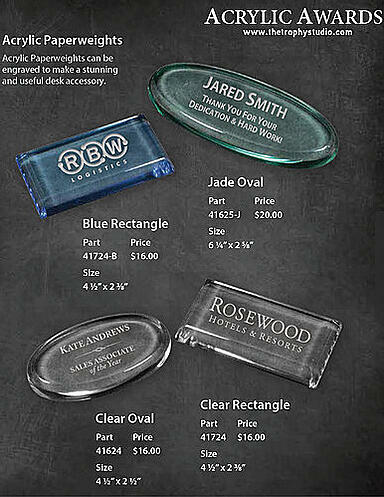 Acrylic paperweights are available in clear oval, blue rectangle, jade oval, and clear rectangle. Crystal paperweights cost a bit more but have a stunning appearance. They come in a variety of shapes, such as heart, star, cube, and diamond. If you have something in mind that is not mentioned above, contact us anyway. The chances are good that we can make your vision a reality. 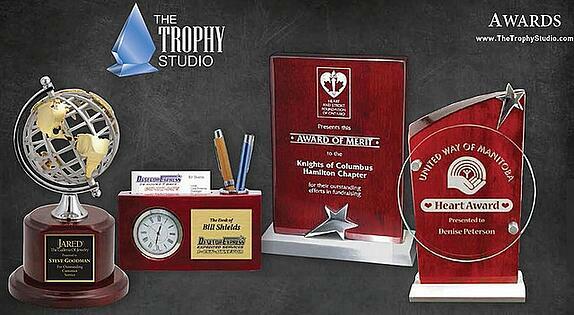 We are skilled at custom designing paper weights and photo frames. Plus, our high-tech laser engraver can render any graphics or text you want on your piece. We recommend including your corporate logo. If you are interested in learning more about laser engraved paperweights and photo frames for your organization, contact the friendly experts at The Sign Studio today for a free consultation. We have discussed metal plaques and their many uses in this blog before, but we have never touched on the versatility of wooden plaques…until today. 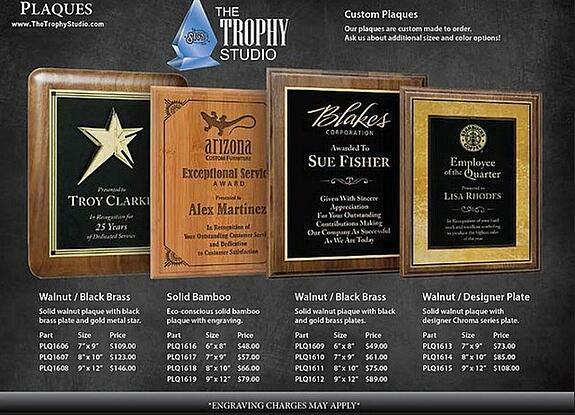 Custom wooden plaques in Los Angeles are an excellent choice for honoring employees, donors, sponsors, and others. And, they are great for use in any indoor environment. Today, we are going to take a closer look at these awards. Wooden plaques consist of rectangular blocks of wood that are about half an inch thick and feature engraved faces. Plaques can be made from a variety of different types of wood. They also come in different sizes, colors, and finishes. Each plaque features holes on the back for easy mounting. Wooden plaques are generally presented to individuals or businesses that have gone above and beyond. For instance, we get plenty of requests for plaques that recognize workers’ many years of service, exceptional work in a specific field, Employee of the Month, and more. Organizations also present wooden plaques to their top suppliers, vendors, or for special designations within a certain community. If you run a nonprofit, art gallery, or museum, wooden plaques can serve a range of uses. You can show your appreciation for your donors and sponsors by displaying their names in an elegant way. Wooden plaques can also be used to identify different permanent exhibits and pieces. Cherry / Black Brass – This cherry wood finished plaque comes with a black and gold engraved plate. As with most of our plaques, the standard sizes are 6” by 8”, 7” by 9”, 8” by 10”, and 9” by 12”. Walnut / Designer Plate – This plaque is made of solid walnut and features a designer plate that gives it a distinguished appearance. Solid Bamboo – If you are looking for a green alternative, solid bamboo plaques are an eco-conscious option. Cherry / Silver – This cherry finish plaque with a silver plate is one of our most affordable solutions. Walnut / Brushed Gold – Another cost-effective plaque is this walnut finish piece with a brushed gold plate. Walnut / Black Brass – There are several different styles of this walnut/black brass alternative, including one that incorporates a gold metal star. This is just a taste of what we have available. If you have something else in mind, please call us to see if we can make it a reality. Thanks to our state of the art laser engraver, we can engrave all of the plaques we offer with your custom message. We can even incorporate your business’s colors, logo, and fonts, so you will boost your brand awareness wherever the plaque is displayed. If you want to buy custom wooden plaques online or over the phone, you can contact The Sign Studio today to get started. We can help you out even if you are working on a tight timeline!